Sunday, July 5, 2015, will be remembered as a historic artistic event, as the Monaco Dance Forum in coproduction with the Grimaldi Forum, presented the Bejart Ballet of Lausanne & The Tokyo Ballet reunited around Bejart’s audacious and mythical masterpiece,The 9th Beethoven Symphony, with texts by Friedrich Nietzsche and Friedrich von Schiller. It was premiered at the Cirque Royal in Brussels on October 27, 1964, Ballet of the 20th Century. Accompanied on stage by the Philharmonic Orchestra of Monte-Carlo, under the direction of Antonino Fogliani, the Chorus of the Opera of Monte-Carlo and four solo singers: Aga Mikolaj, Karine Ohanyan, Donald Litaker and Gerd Grochowski. For Bejart, Ballet is movement that expresses feelings that corresponds to the music and creates images that reflect human passions in all its forms, from anguish to joy, interpreted by the dancers with unconventional gestures. It is at the same time theatre, singing and dancing. Béjart himself said, “Ballet is part of the theater; I want my dancers to be on stage like human people… who give emotion to the audience.” Béjart’s works infused ballet with an energy and controversy that attracted young viewers and markedly reconsidered the art. Both the Monte-Carlo Philharmonic Orchestra and the Chorus joined the dancers from the Bejart and Tokyo Ballets on the stage, making for a truly impressive operatic performance. Having hundred dancers on the same stage was truly monumental and thrilling! 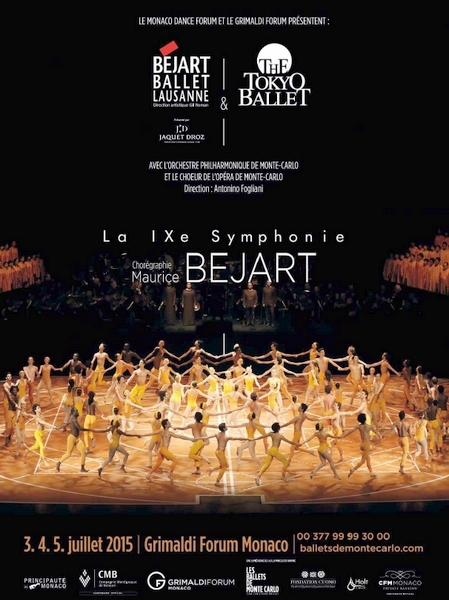 Specially during the Ode to Joy that resonated in the whole theatre, connecting the audience with the dancers in a powerful embrace, as Bejart probably meant to. Everyone of the dancers from both companies gave it all in their performances, but Colombian Oscar Chacon, from the Béjart Ballet, deserves a special mention for commanding such a strong presence. Chacon who joined the Bejart Ballet in 2004 has restaged many important roles in choreographies by Maurice Bejart, such as the Phoenix in Bird of Fire or Tristan in Zarathoustra to name a few. Of a slender and elegant figure, he interpreted the solo yesterday evening with strength, grace and lightness. It was fascinating to watch him dance with so much energy, passion and contagious jubilance, making you shiver with pleasure. At the curtain call the audience gave a repeated standing ovation! Bravo! Béjart was born Maurice Berger on January 1, 1927 in Marseille, France. His father was the philosopher Gaston Berger. Young Maurice started ballet in late childhood from a doctor’s recommendation as a way to recover his strength after various illnesses. He later changed his surname to Béjart to honor Armande Bejar, Moliere’s wife. In spite of his height 5.4’, not ideal for a dancer, he trained in Marseille, Paris and London, where he was a student Vera Volkova, Margot Fonteyn’s teacher. He joined the International Ballet Company in London in 1948, also working for The Cullberg Ballet, and appearing as a guest artist for the Royal Swedish Ballet, before launching his own company in Paris in 1953, Les Ballets de l’Etoile, which in 1957 became Ballet-Theatre de Paris de Maurice Béjart. Symphony for a Lone Man, in 1955, established his notoriety as a pioneer by blending theater into Ballet. He established schools in Belgium, Africa, and Lausanne. Surrounded by fame and celebrities, he reportedly lived simply and mostly alone, although he had a long-term relationship with the Argentine dancer Jorge Donn. He created the Bejart Ballet Lausanne (BBL) in 1987. In 1993, Gil Roman became deputy director of the BBL and in 2007 he succeeded Bejart as the head of the company. Roman regularly takes the company abroad to showcase Béjart’s works.